Ten years ago the sheep farming sector in New Zealand was facing some tough assaults upon its claim as one of the country’s most important export sectors. Strong growth in dairying was knocking sheep farms out from some of the country’s most traditional sheep farming areas like King Country and Southland, while exceptionally low returns were threatening the viability of many smaller drystock units struggling to stay afloat. Fast-forward 10 years and the sector can claim to be one of the most sustainably profitable contributors to the pastoral sector. Saleyards around the nation are testimony to the level of optimism the sector is experiencing. Buoyed by almost universally good grass growth throughout the country and a good run through lambing, store lambs are flying out of saleyard gates at record price levels, boosted by good prospects for grass supplies this summer. Lambs are averaging $8 per kg, well up on last year’s $7.20/kg at the same time. At a consumer market level, supplies remain tight through all NZ’s key markets, thanks in part to the consistent decline in sheep numbers NZ has experienced in the last 10 years. Sheep numbers peaked in 1982 with a total of 70 million sheep, but the national flock has been in decline ever since, with today’s numbers at 27.3 million. Productivity gains have been impressive, with the sector generating almost the same tonnage of sheep meat today off that drastically reduced number, thanks to farmers’ efforts to lift lambing rates to average 129 per cent this season. Last year market analysts AgriHQ reported it had been many years since supply and demand were so closely pitched, despite the exchange rate remaining a thorn in exporters’ side. It also came as NZ’s largest competitor Australia was battling to supply markets, with drought and feed issues continuing to plague key supply regions. The latest Rabobank report out in late-November shows sheepmeat remains at the front of what is overall a very upbeat red meat outlook. Rabobank animal proteins analyst Blake Holgate says despite some consumer resistance to higher prices and possible disruption of Brexit in the traditional markets of United Kingdom and Europe, China and the United States are likely to underpin continuing strong prices. New Zealand’s success in securing high sheepmeat prices has also been boosted by a growth in demand for traditionally lower value cuts, including flaps and bellies. Chinese demand for these items has them used in traditional hot pot dishes moving the items well up beyond traditional commodity price levels. New Zealand is also facing its lowest lamb kill on record, despite a record high lambing season. The average lambing percent was up 1.7 percentage points at 129 per cent, well above the 10 year average of 121.4 per cent. The greatest decline in lamb numbers has been in the North Island, down 3.2 per cent, while the South Island rose by 1.7 per cent. Federated Farmers meat and fibre chairman Miles Anderson says the returns had been a long time coming, but are now where they need to be, and it is a good time to be a sheep farmer. Confidence is the strongest since 2011 and his one caution is that prices remain sustainable. “I just hope we don’t gouge prices and put people off buying lamb,” says Miles. 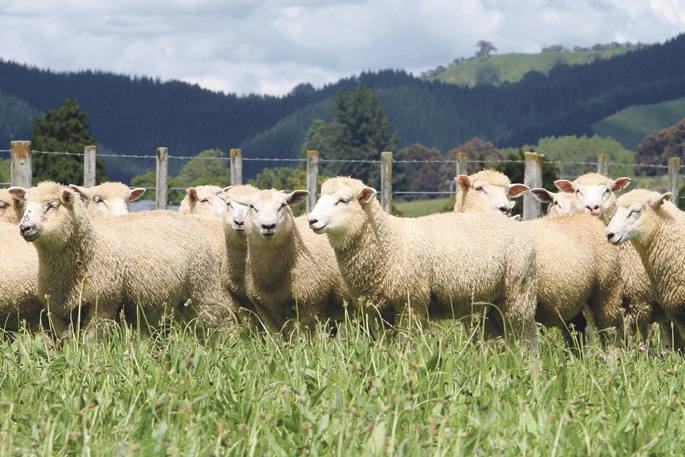 Bayleys Southland agent Hayden McCallum reports solid interest in high quality established sheep operations in Southland, with buyer expectations around the $1000 a stock unit price range. He settled a property three months ago at $950 a stock unit, which left sufficient in the buyer’s pocket to reinvest back into some upgrades needed around the property. Hayden has just finalised a sale in Southland on a 211ha sheep and beef property for $2.7 million which includes 16ha of forestry on the property. The greatest risk facing the sheepmeat sector at present may be that its numbers continue to fall too far. A recent Beef + Lamb NZ report shows this year’s lamb slaughter is the lowest since 2011, and despite exceptional productivity gains increase in breeding numbers are now needed to maintain the sector’s critical mass.